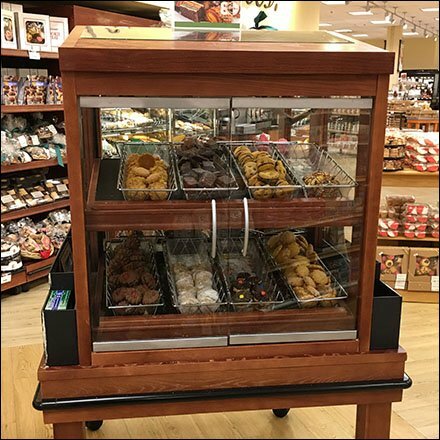 If your cookies are outstanding, or maybe even Continental in style, maybe your bakery department outfitting should reflect the upgrade as with this European Cookie Museum Case At Kings? Here the presentation is in a wood, almost Museum-case-like Cabinet. I might have made the sign larger, but maybe the case alone speaks volumes. Consider this European Cookie Museum Case At Kings from various distances in the gallery of images.